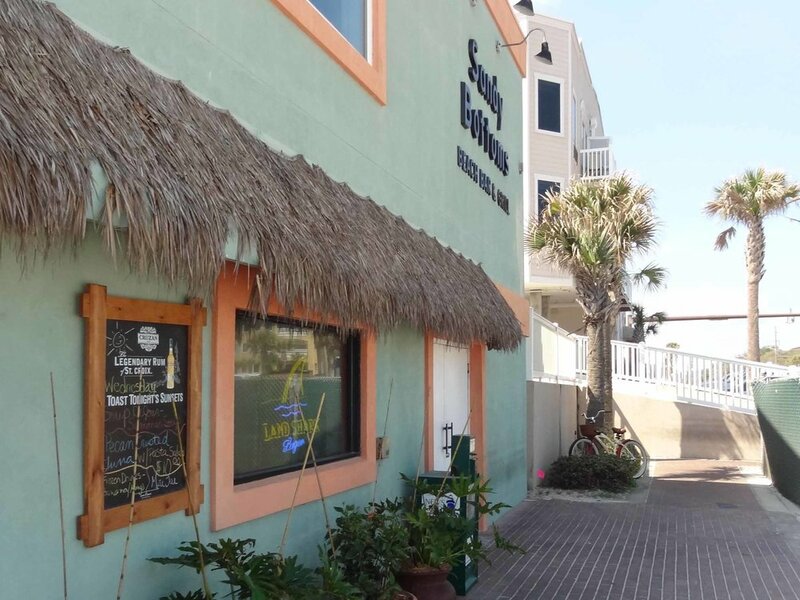 The Sandbar and Kitchen is a Florida beach bar located in Fernandina Beach. Discover this great Florida beach bar. Located right on Fernandina Beach you will find the Sandbar and Kitchen, Amelia Island's only restaurant that is located directly on the beach. You can actually sit at a table in the sand and put your toes in the sand. Only a few steps from the Atlantic Ocean and located in the sand is appropriately named Sandy Bottoms. A true Florida beach bar where bathing suits and bare feet are welcomed and expected. Choose a table located in the sand or opt for one on the covered patio. Or you can sit inside where there is air conditioning and a bar. The outside area is aptly name the Ocean Oasis Beach Bar. It is here that you will find live music Saturday and Sunday. Since the season this far up north starts in late March or April, check their web site for the music schedule. Like many bars, the amount of live music goes up with the heat index. There is ample parking nearby. This Florida beach bar is such a great place to relax and enjoy the Atlantic Ocean and its beauty.